California Central Valley Modular On30 is a freelanced narrow gauge railroad located in Central California during the time period between World War I and World War II. 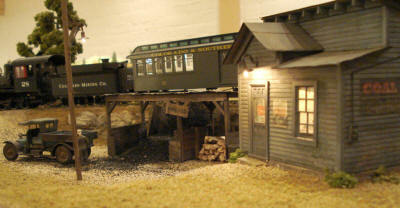 The goal of the CCV is to have fun building, displaying and operating an On30 modular railroad. The CCV is one of several California On30 Modular groups that builds to a common standard to allow us to combine operations when displaying at shows and meets. Currently, CCV frequently operates in conjunction with the NorCal/Bay Area California Central Coast Modular On30 (Yahoo group: CCCModOn30), and the California South Coast Modular On30 (Yahoo group: CSCModOn30). We welcome anyone interested in On30 modeling/operation to join us. We currently have active members located in the greater Fresno, Visalia, Hanford and Bakersfield areas of the Central Valley.